What a fabulous coincidence! Serendipity! Fate! As I was driving with Karl to the store at Moose Lake, I impulsively asked to be dropped off at the Moose Lake Flea Market and look for some fresh local flower bouquets. I casually commented that I wondered if T.J.'s daughter was selling her home grown sunflowers up at his store, T. J. 's Country Store (Home of the Best Wurst) in Mahtowa, MN. But, no, we didn't have to drive up there today. I was thinking that we'd go up there next weekend and buy some brats and bacon. I got out of the car and walked through the row of vendors outside the Flea Market warehouse. At the very last tent there was a family of three selling beautiful sunflower bouquets in glass jars. I commented to the group that I had wondered if T.J's daughter was selling sunflowers today, but we didn't drive up there, so how lucky I was to come across their sunflowers. They all made eye contact with each other and the women said "I am T.J.'s daughter, Sarah, and this is T.J.'s granddaughter." Not wanting to be ignored the man jumped up and said "I'm T.J.'s son-in-law, Dave. We all laughed at that one. They talked about their sunflower business, "Sunflower Sisters" and their farm. I relayed several compliments about their delicious brats, sausage, bacon and their sunflowers. Can you imagine that the next person who joined our friendly conversation was none other than the "J" in the name T.J., the wife of the owner. I recounted my story of being held "hostage" by their bouquet of sunflowers I bought last year (August 2014). I must have taken 30+ pictures over three days up at the cabin. I kept making minor variations on the angle of the light, fruit, vegetables, serving platter, etc. Sara said "Come up to the farm sometime and you can see all the sunflowers in the field." Hopefully that will happen someday. We drove home and Karl went to his easel, canvas and paint brushes to "work." 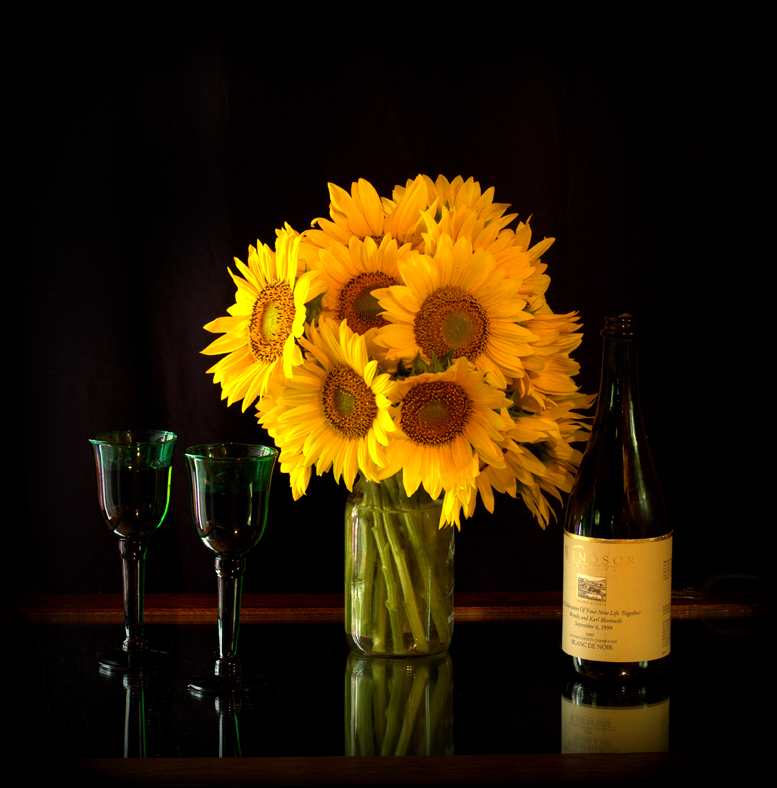 I went into the cabin aka my Studio Up North and set up a still life portrait commemorating our upcoming 16th Wedding Anniversary with today's sunflower bouquet and the wine bottle given by Betsy & Jack Doyle at our 1999 wedding celebration. I'll be creating this into one of several different wedding anniversary cards for Karl. 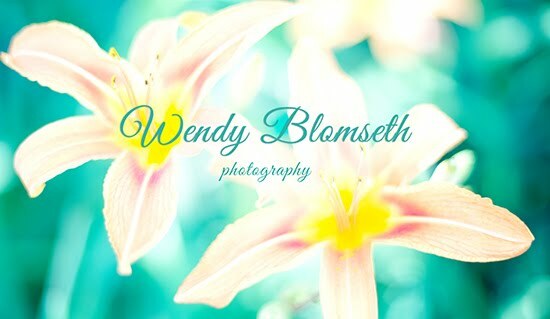 I am very pleased with the simple composition and rich saturation in the colors, especially the flowers, of course. 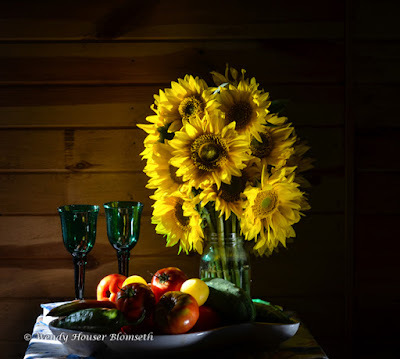 But, tomorrow is another day and quite possibly, if the sun comes out for me, I'll be held "hostage" once again creating a new still life portrait being kissed by the morning light.